One of a group of Common Crossbill in the small park near my apartment. Winter arrived somewhat late this week, very cold and lots of snow. The snow was blowing off the trees and into my face as I was snapping the Crossbills. The first day I saw them (Tuesday) it was actually sunny but god it was cold and windy. I have to say crossbills are possibly my favourite bird. I love the colouring and the way they clamber over the pinecones like little parrots chirping and warbling away and ignoring me craning my neck trying to get a decent angle for a shot. I missed a couple of males with pinecones raised aloft. Also a lot of shots were ruined due to crappy exposure settings as the lighting changed quickly depending on the background. Still, I forgive them. I got some great shots last winter and hopefully they'll stick around for a few more weeks yet. On Sunday they were still present and the males were less camera shy. The weather was really nasty on Sunday morning (even the city trams were disrupted. This may be par for the course in the UK but not here in hyper efficient Japan I assure you). The slushy wet snow was being blown off the trees in the afternoon right into my face as I was taking these shots. It was tricky as half the time I couldn't even see anything as the viewfinder was covered in icy water. I was standing in the melting snow with freezing feet too. A lot of blurry out of focus shots or massively under or over exposed again but I still got quite a few keepers this last week. More (lots more) Crossbill shots here and here and here. It was a great week for finches. Also in the park were Brambling, Hawfinch, Bullfinch and Long Tailed Rosefinch and elsewhere there have been both Redpoll and Siskin. Here's a male Bullfinch out at Shikabe last Wednesday. We were at Onuma on Wednesday and there was a different Owl in a different hole again. And I even took a couple of crappy videos of them with my3X zoom on my crappy old compact digicam. And here's the cameraman. 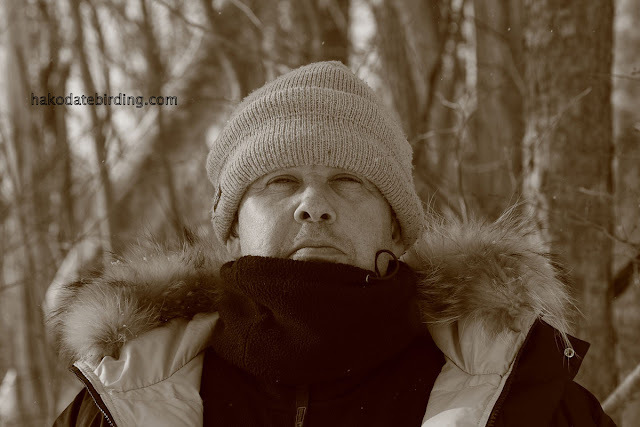 Some fat grumpy 40 year old guy adrift in the snowy wilds of Hokkaido. I wasn't over dressed, honestly, it was freezing cold. I don't know what this Red Fox was eating but it had fur. A squirrel maybe? More shots from Onuma are here and here. So winter hit Hakodate this week. Maybe global warming is taking a short break from destroying the planet, bodes well for our trip up north next weekend. The sea ice has apparently arrived at Shiretoko and now all we have to do is get up there and see it. Not much of note in my small world this last 7 days. My wife got some of those Kenko extension tubes for her macro shots. I tried them on my 100-400 and may even use them for ultra close-ups of the Nuthatches some time. Maybe. Perhaps. My parents are in Vietnam at the moment and off to Cambodia next week. I haven't done any real travelling for years, Malaysia in 2002 was the last exotic place I visited (and that was only a week stopover on the way back to Japan from a visit to England). I went to Venezuela in 2001 and India/Thailand/ Nepal in 1998. All those trips seem like a lifetime ago, I wonder when or even if I'll ever go to those kinds of places again. The footy season is entering the most crucial stages now. Can Liverpool's team of mediocre overacheiving joureneymen foreigners knock out Real Madrid, keep abreast of Man U and then go on to beat them at Old Trafford? It would be nice of they could. Still 2nd place in the league would be an improvement of sorts. I just wish that had some local players coming up through the ranks, of course I appreciate the likes of Torres, Alonso, Hyppia and Mascherano but it's becoming very very difficult to really muster any enthusiasm for the likes of Kuyt, Babel, Aurelio, Arbeloa and Leiva. Man U won again last night (I didn't watch it though I watched the Chelsea and Arsenal games), 8 points clear...........*edited to add* oh dear a draw against Man City, 7 points to make up with 12 games to go. Nah, no chance. Can't believe England may lose a series against the Windies (and 15 years ago I could never imagine even thinking about writing that sentence). Food of the week: Salmon flakes on rice with soy sauce and furikake. Cheap and healthy (as long as I don't squirt too much mayo on top). Song of the week: 'Sway' by the Rolling Stones. An overlooked golden blast from the past. Annoyance of the week: Japanese right wing groups in their propaganda vans. Morons. Also the Mac OSX application 'iweb'. I use this to write my other blog. I like Macs a lot but iweb 09 is crap, lots of bugs. The photos are often out of sync (ie the wrong pics on the wrong posts) and if you upload an entry with more than say 10 photos it seems to cause all sorts of problems. Plus the pages it creates take ages to load. I get a lot less hits on that blog than this one, sometimes it doesn't show up in the search engines. Apple:sort it out! Good point of the week: I don't live in the UK and can avoid reading about and/or discussing Jade Goody and 13 year old fathers. Oh and I may be absolutely skint but at least I'm skint in a currency that is holding its' value. Birds of the week: Crossbills. You've just got to love them. Photoshop timesaving find of the week: the red and yellow boost in the saturation menu, very nice for male and female Crossbills. I am back in London now and the temperature is rather mild here. I was lucky to leave Hakodate last Saturday as it seems like the weather has deteriorated badly since then. The three outings we had were excellent and I really enjoyed them. Thank you. See you next time you hit Hakodate!